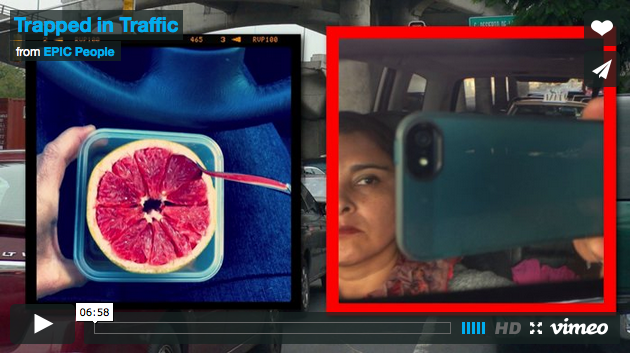 While spending long hours of her everyday commuting in Mexico City traffic, capturing urban moments with her mobile camera lens and sharing them through social networks, the author reflects on emotions, inequality, beauty and time. How can someone be present and absent at the same time?, in this overwhelming traffic of people, machines, information and ideas ‘on the move’. How does each object or character defines it’s own cultural geography and tempo, constructing a new pervasive mode of mobilized social inclusion and exclusion. Is this a way to avoid boredom? Or has she found a way to connect in this mobility paradigm by opening a door that has not yet been completely explored.